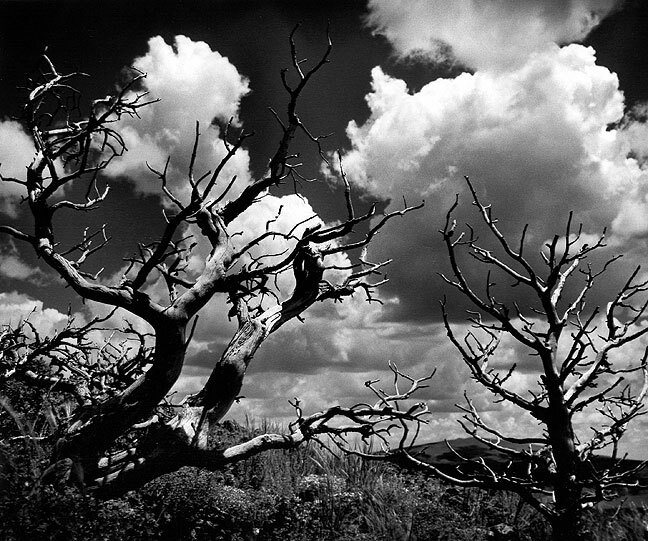 A clearing thunderstorm is backlit by afternoon sun in this view from a cliff above Villanueva State Park, New Mexico. 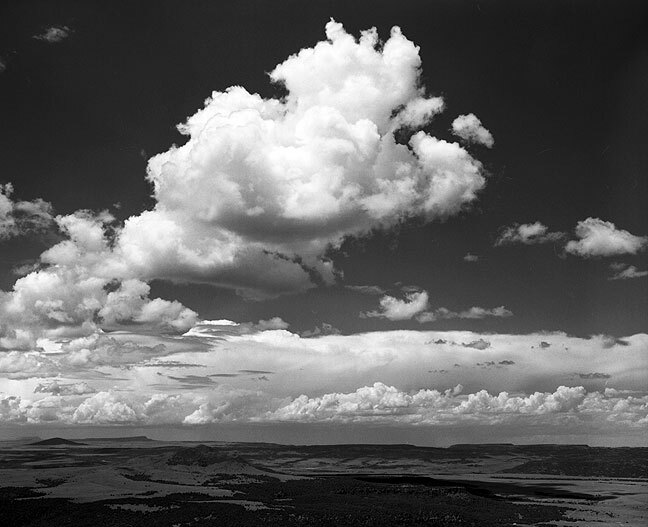 Made with my Fuji GW670III medium format camera and shot with an orange filter on Kodak Verichome Pan Film, it is one of my favorite black-and-white landscape images of the film era. 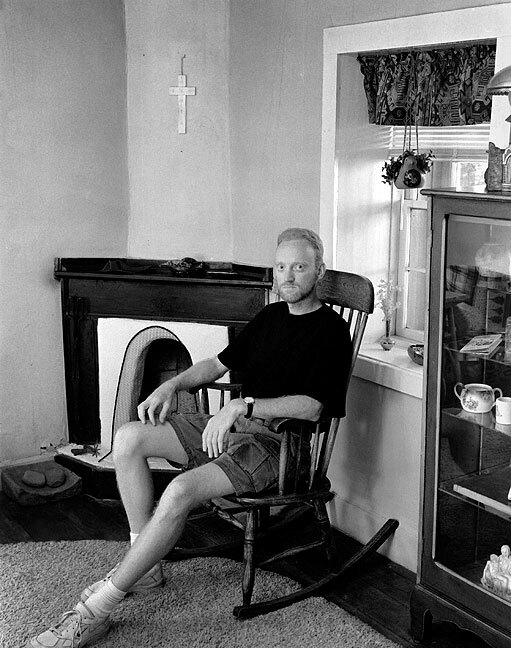 In the summer of 1998, my newspaper made the transition from conventional cut-and-paste production to desktop publishing, which meant instead of printing, I would be scanning my images. 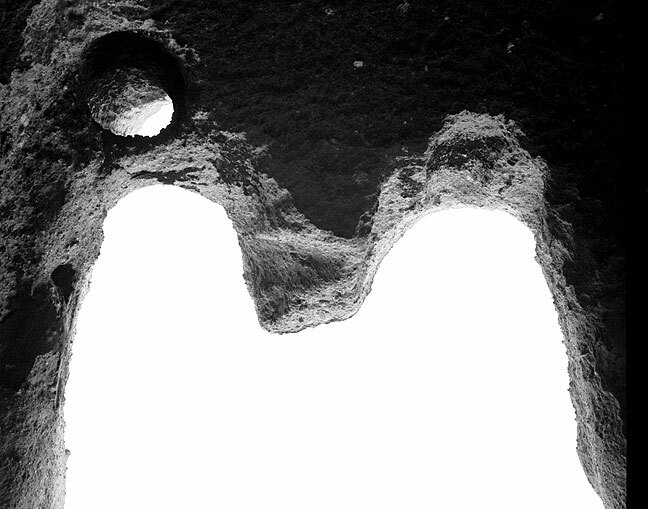 I happily began using my new Nikon LS-2000 scanner, and abruptly stopped making photographic prints. It happened that I still had over 1000 sheets of black-and-white glossy printing paper in stock, so I began to ponder what to do with it. 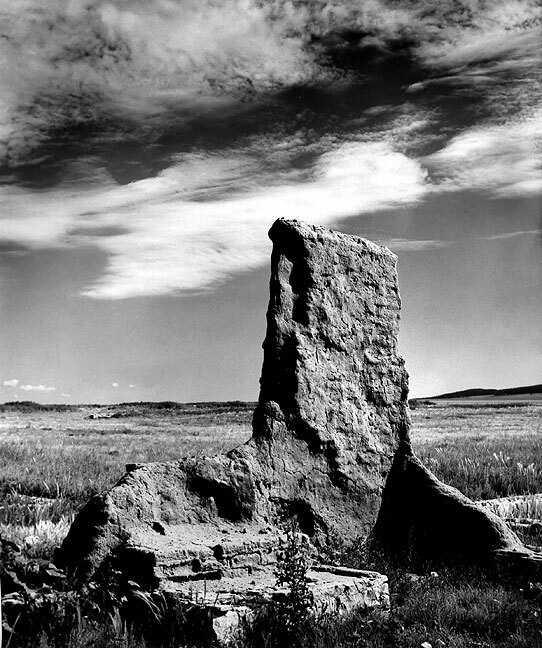 Eventually I concluded that I wanted to shoot something new, preferably medium format black-and-white with my Fuji GW670III, and preferably somewhere in the desert. 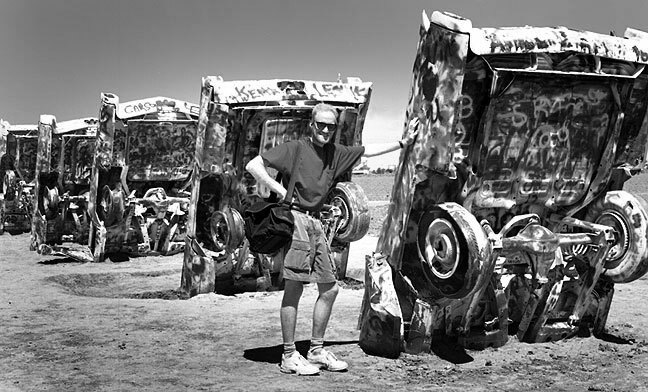 Your host poses at Amarillo’s Cadillac Ranch on the road to Villaneuva. By the spring of 1999, I knew I wanted to do a New Mexico tour, so I asked a friend if he wanted to join me, which he did. 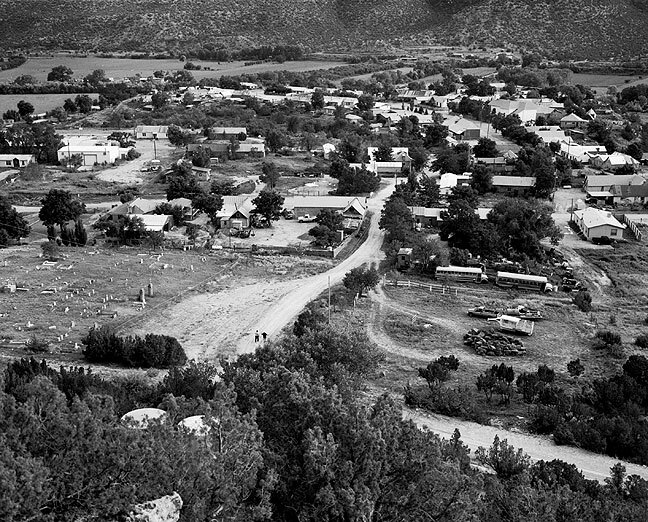 Another friend’s uncle had a vacation house in Villanueva, New Mexico, and agreed to let us use it for a week in July. 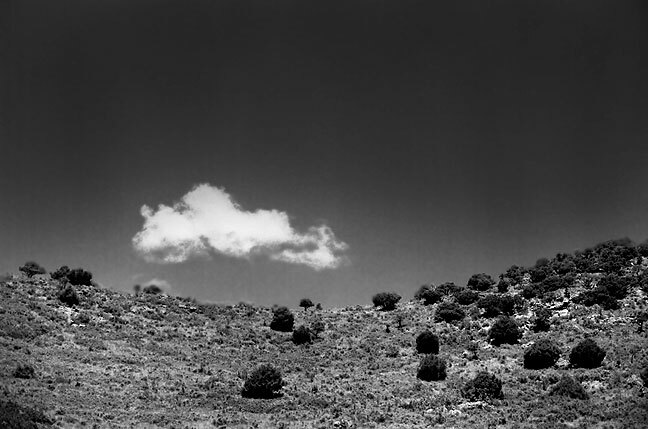 This was the first image I made on this trip, of a ridge on New Mexico 3 south of Villanueva, as the deep blue sky started to fill with afternoon cumulus clouds. 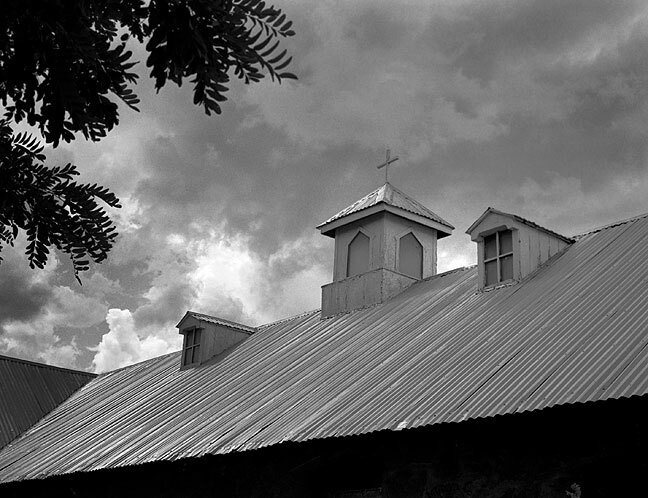 We arrived in the tiny desert hamlet near the Pecos River by about 2 pm, and after settling in to our borrowed adobe abode, began shooting. We walked around town to make pictures, but were set upon by a sudden downpour. 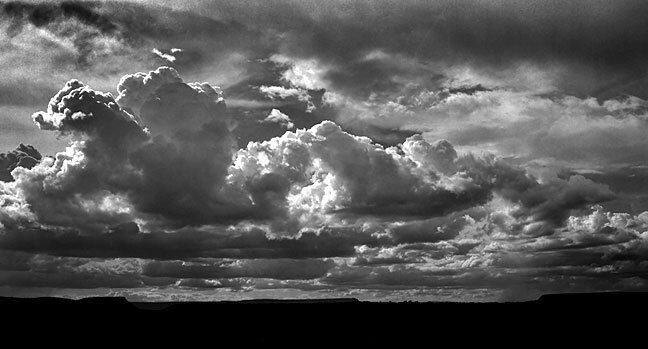 Later, we hiked across the Pecos at Villaneuva State Park to an overlook to photograph clearing storm at sunset. Finally, we hiked up to grotto for view overlooking town. 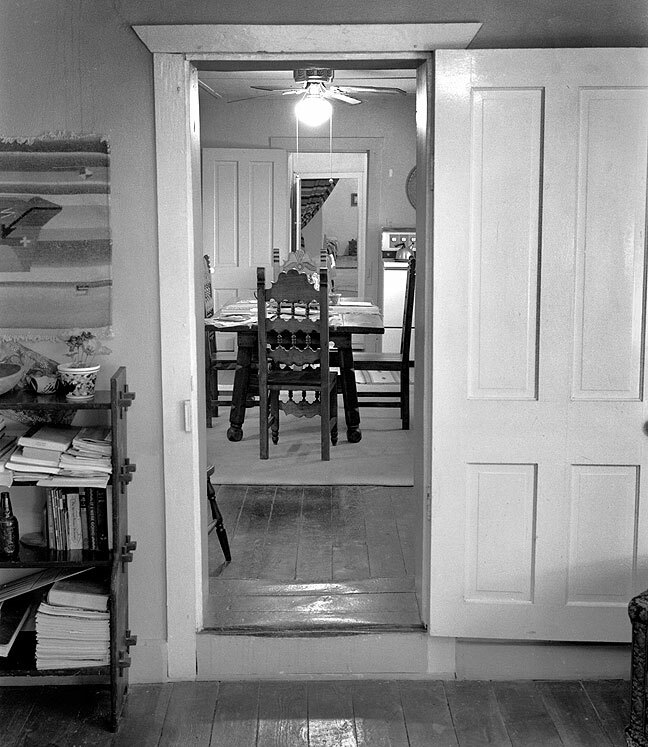 This is the interior of the summer house we borrowed in Villanueva, New Mexico. We had Fort Union National Monument almost entirely to ourselves. 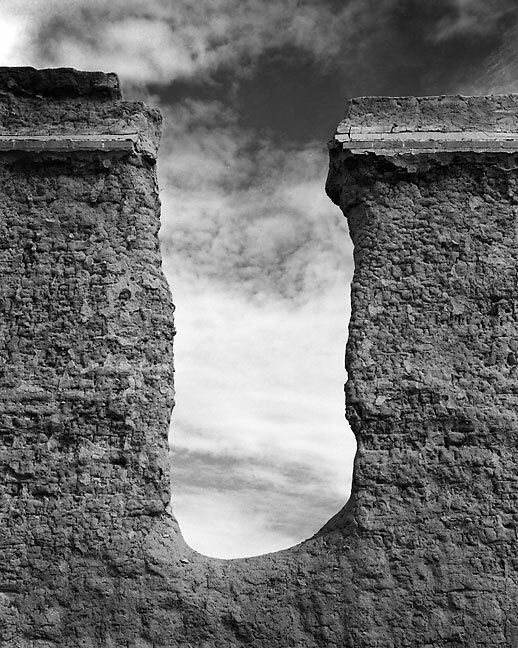 We bypassed the campy exhibits and concentrated on photographing the ruins against a perfect morning sky. 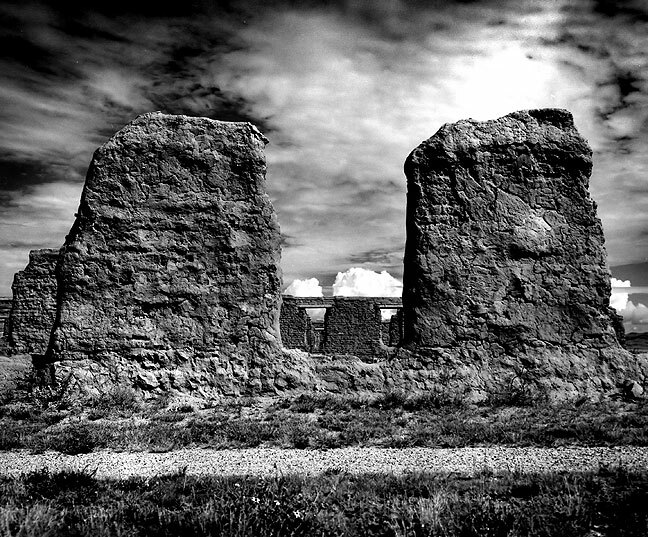 The shapes reminded us of Stonehenge. 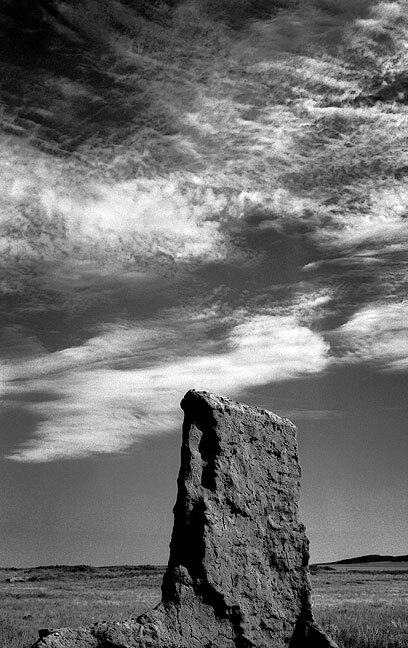 Our next stop was Capulin Volcano National Monument. From the rim we saw excellent views of the Folsom volcano field. Nice hike. Later we drove the length of Cimarron Canyon. 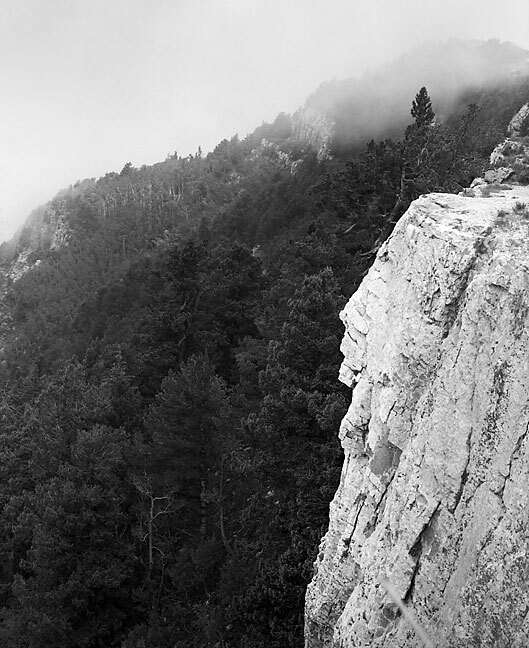 Five minutes of photographic success at the Palisades were followed by rain. 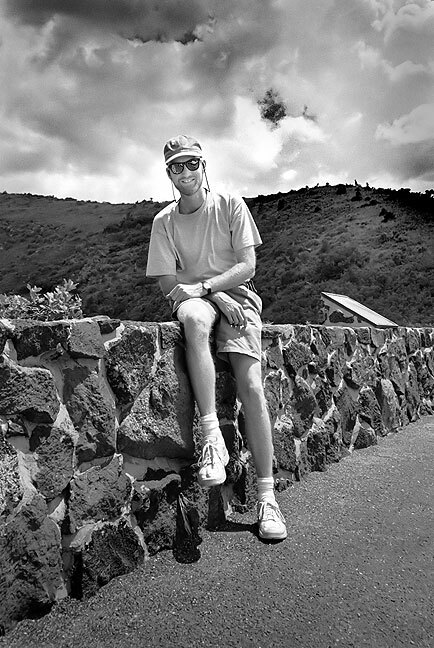 The author poses for a snapshot at Capulin Volcano National Monument, New Mexico. 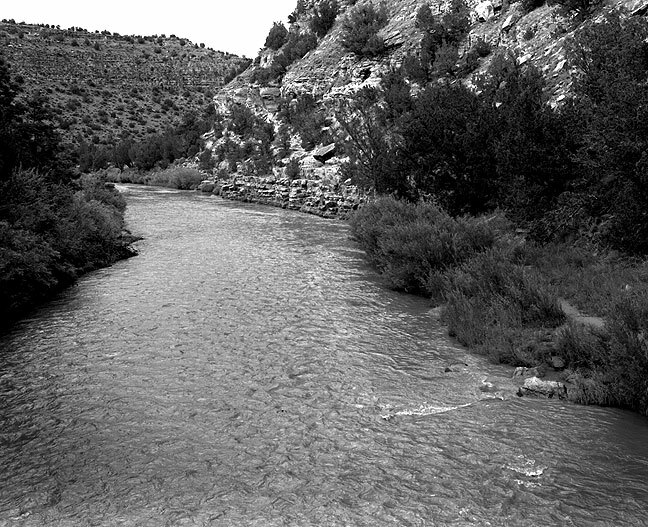 The author poses for an image at Cimarron Canyon, New Mexico. 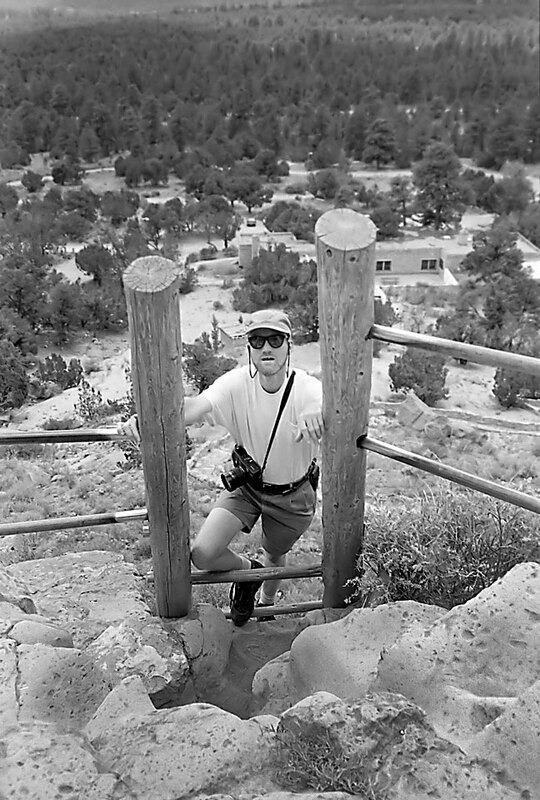 The author climbs a short ladder at Puyé Cliff Dwellings. Note my Fuji 6×7 medium format camera. 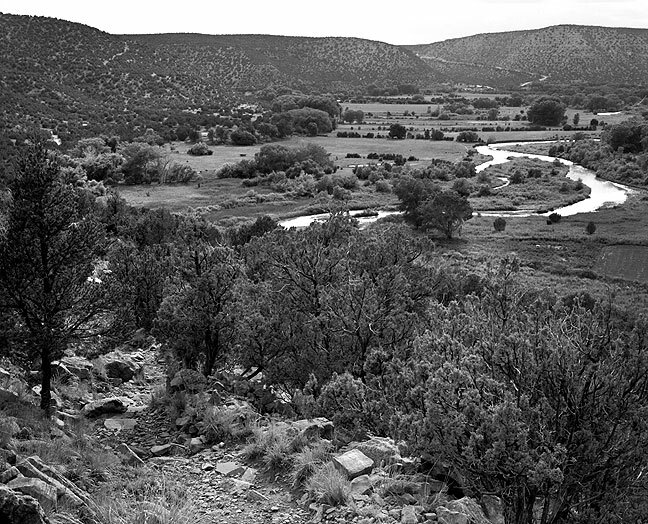 At Pecos National Monument, the light was muted and the view cluttered, so we didn’t shoot much. We made a nice drive up into the Pecos Wilderness Area. 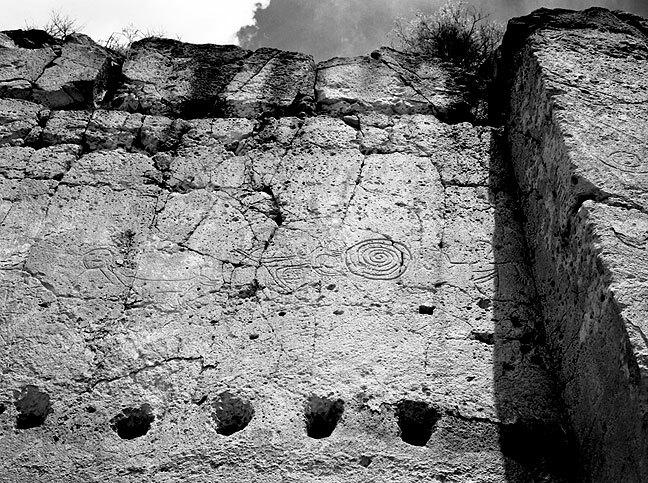 Our next stop was the Puyé Cliff Dwellings, where we shot some nice stuff, and made nice ladder climbs and hikes. In the afternoon, we drove the legendary Chama Valley. It made a few decent images before a thunderstorm ruined our light. At Puyé, I guessed a woman’s camera’s date of manufacture on the first try. 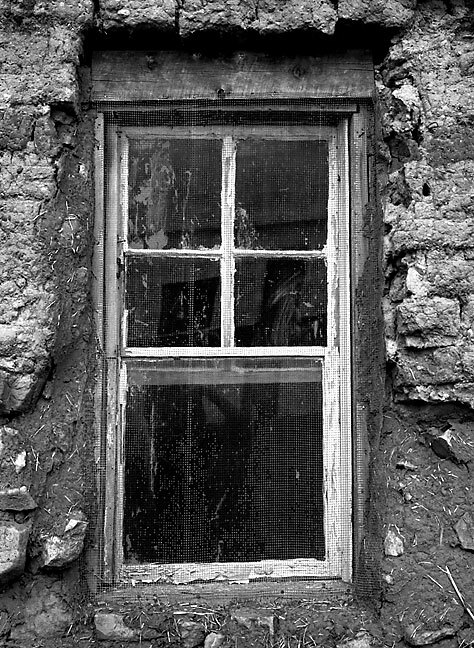 It was a 1970 Nikkormat FTn. 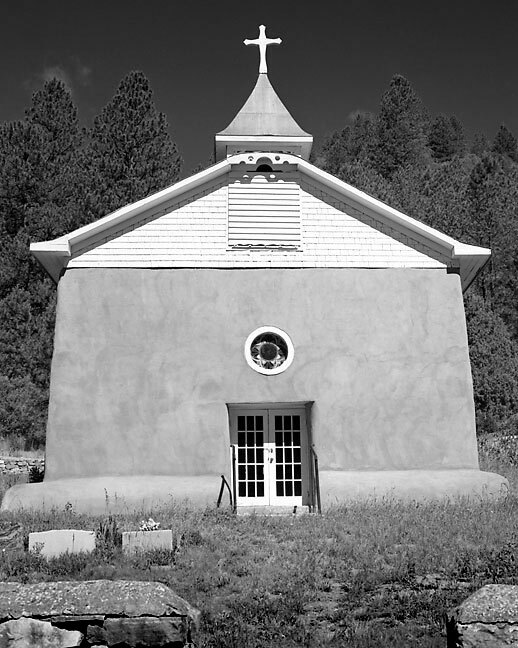 A mission church stands in brilliant morning sun in the Peco WIlderness. 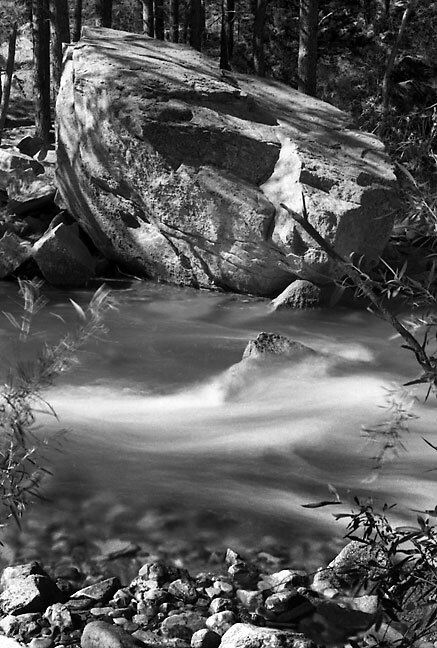 Stream, Pecos WIlderness, northern New Mexico; I made this image on a roll of Kodak Plus-X film that had expired nine years earlier. 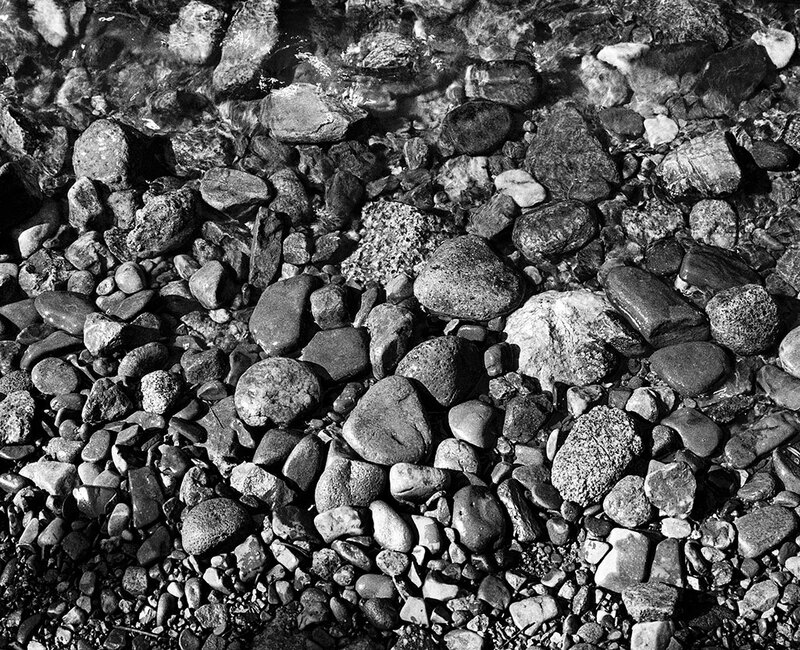 Pebbles catch boring light as the clear waters of the Pecos River flow over them. 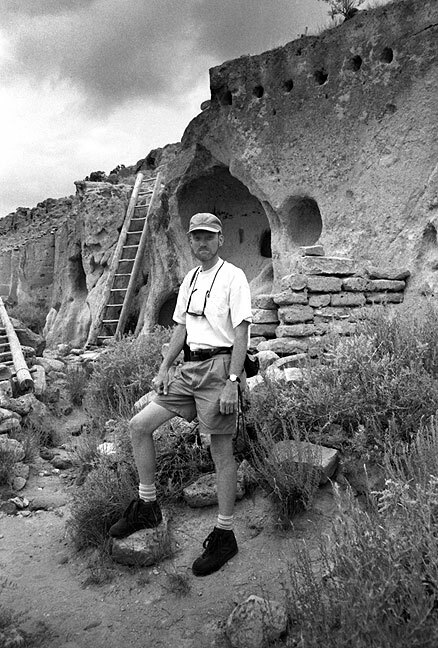 The author poses for a photo at Puyé Cliff Dwellings. 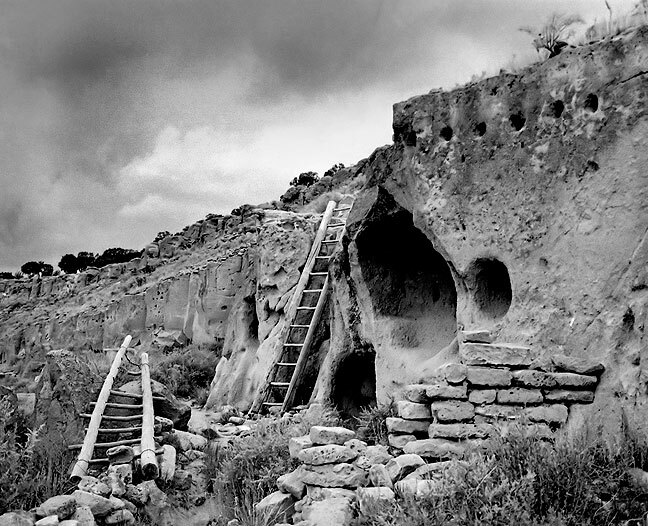 A thunderstorm approaches the face of the Puyé Cliff Dwellings in central New Mexico. 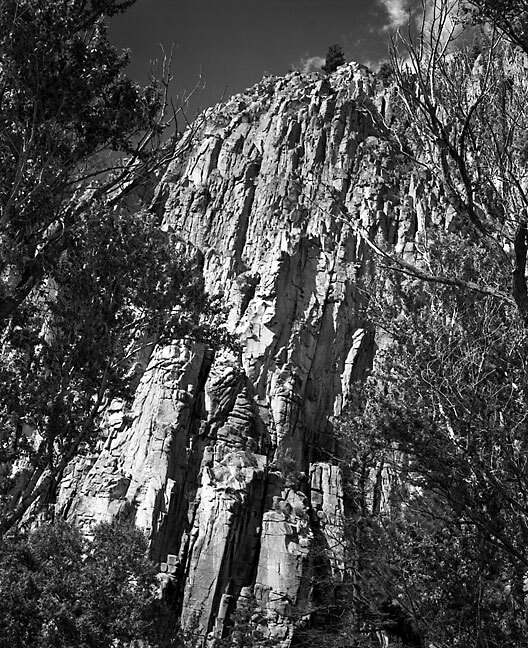 The author shoots with a Fuji medium format camera at Sandia Peak. 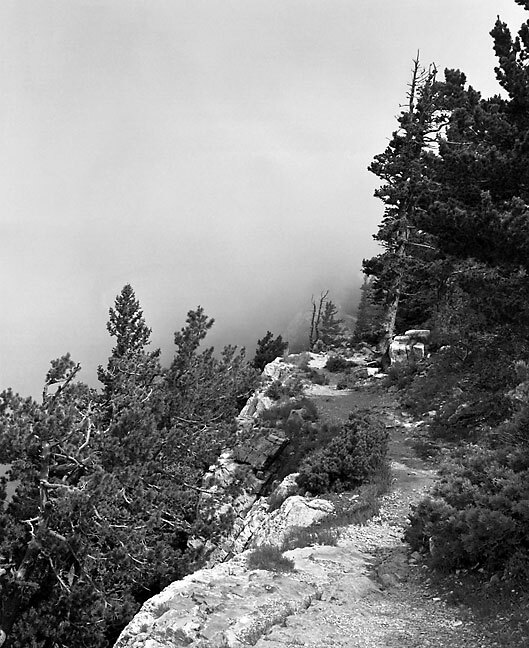 At Sandia Peak we had good light, both sunshine and when the mountain was enshrouded in cool clouds. 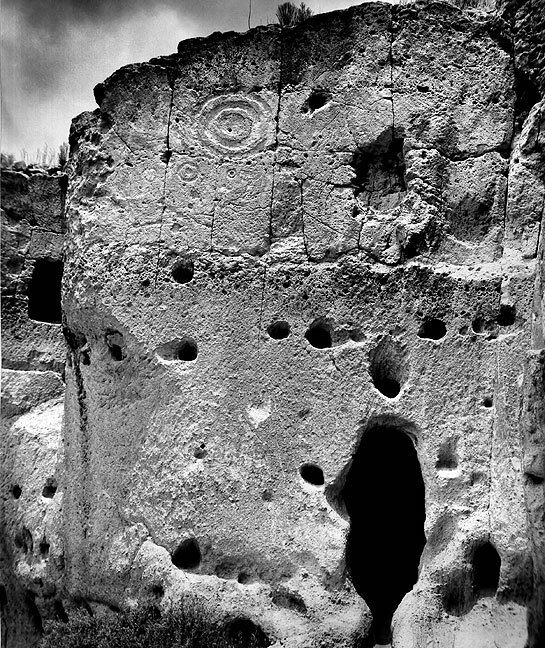 By midday we were at Petroglyphs National Monumentm, which was a bust, both in harsh light and unimpressive sites. We made the long drive to Very Large Array, where we had bad light, but excellent drive and breakthrough conversations. Finally, we had dinner at Luna Mansion in Los Lunas. Clouds envelope Sandia Peak in this view from along Sandia Crest 5000 feet above Albuquerque, New Mexico. 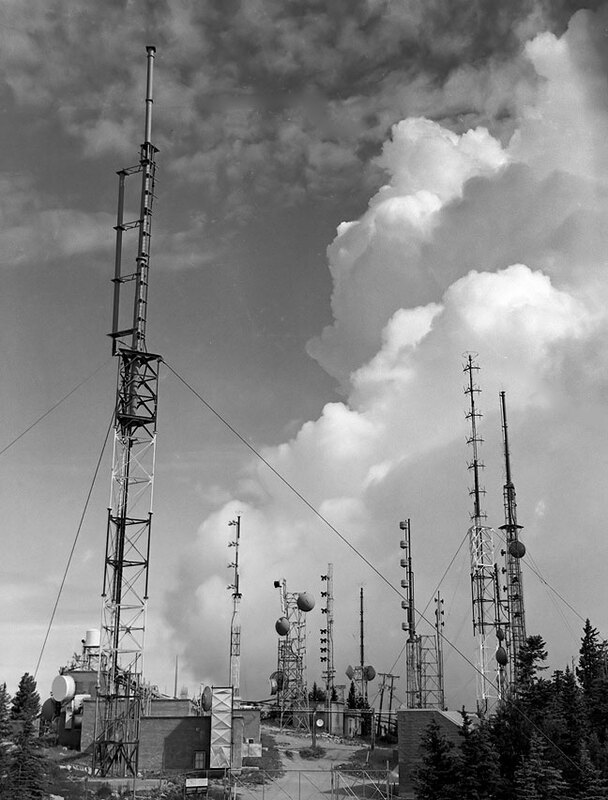 This is the antenna farm at the top of Sandia Crest. Clouds envelope Sandia Peak in this view from along Sandia Crest above Albuquerque, New Mexico. 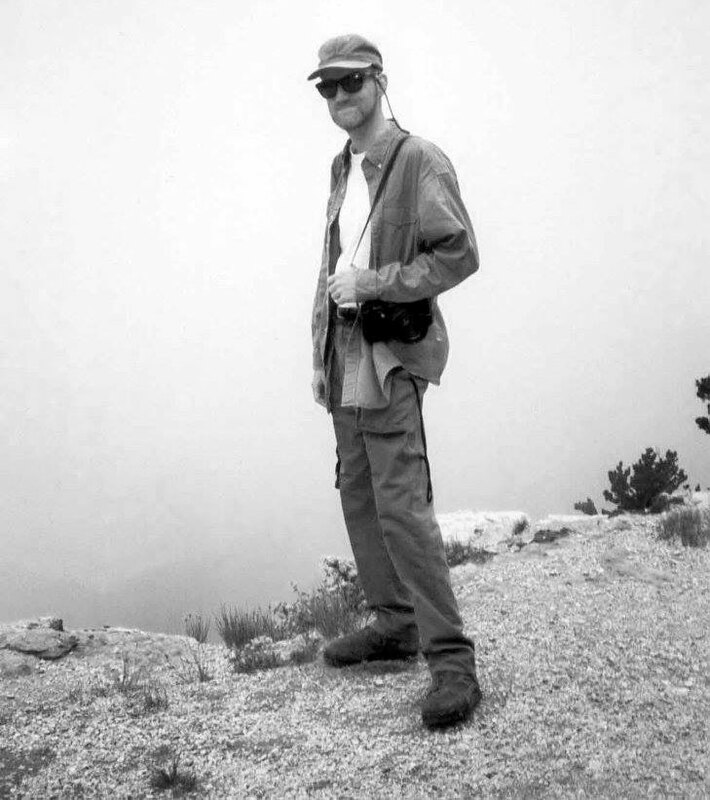 The author stands at cliff’s edge at Sandia Peak as the area is shrouded in fog. 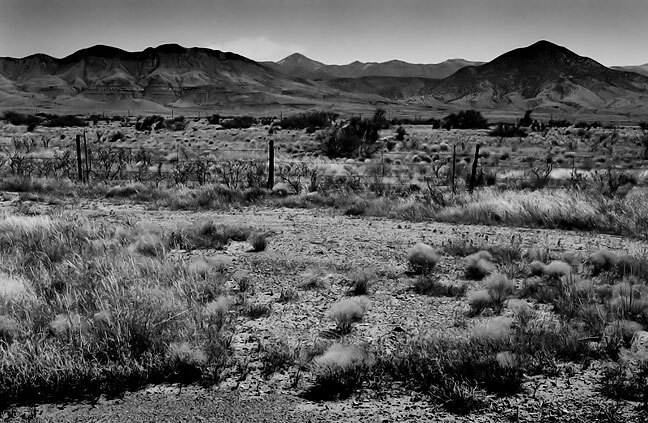 I made this image of the open desert in southern New Mexico on our long drive the Very Large Array. 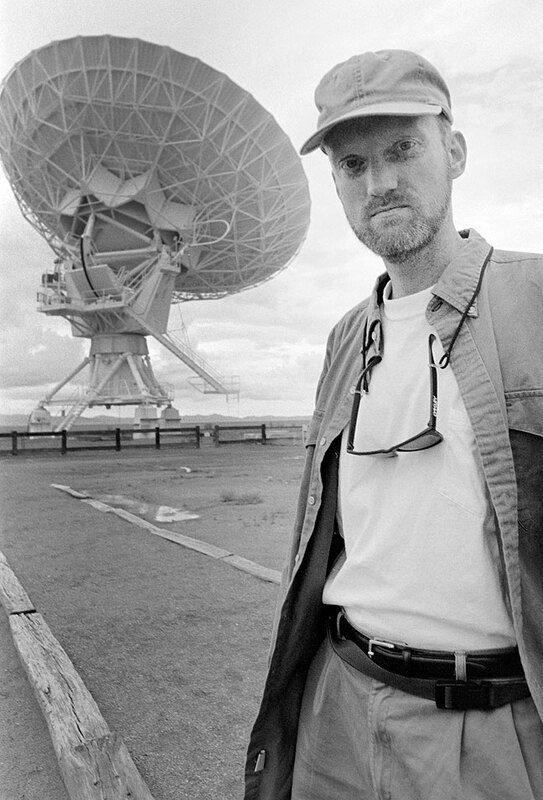 The author poses in flat, featureless light at the Very Large Array near Magdalena, New Mexico. The dreary light and the position of the radio telescope dishes resulted in shooting very few photos. 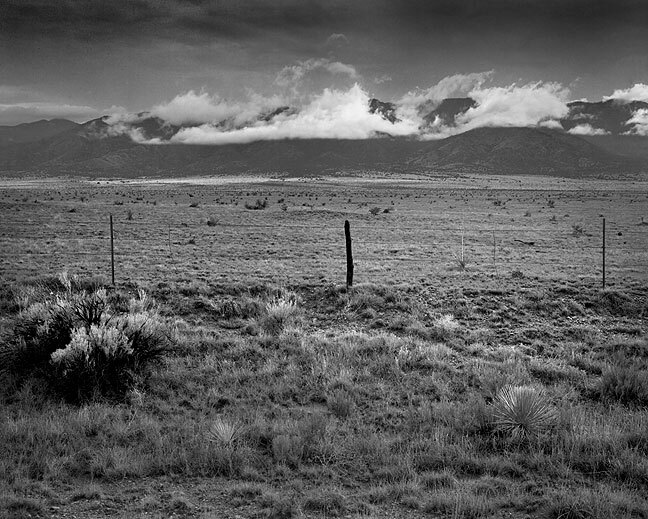 This view shows the San Mateo Mountains west of Socorro, New Mexico. 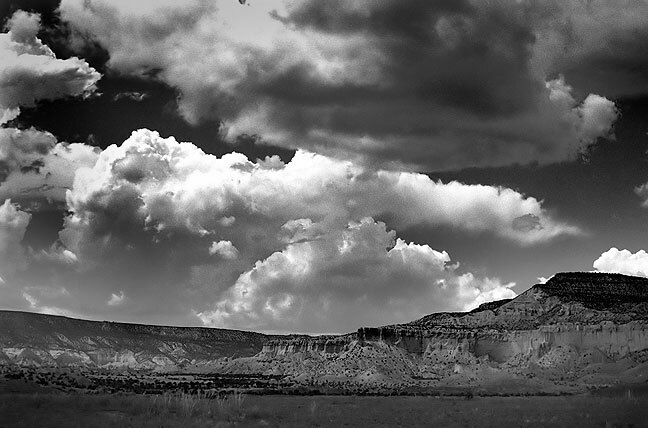 I made this image on the drive east after visiting the Very Large Array. 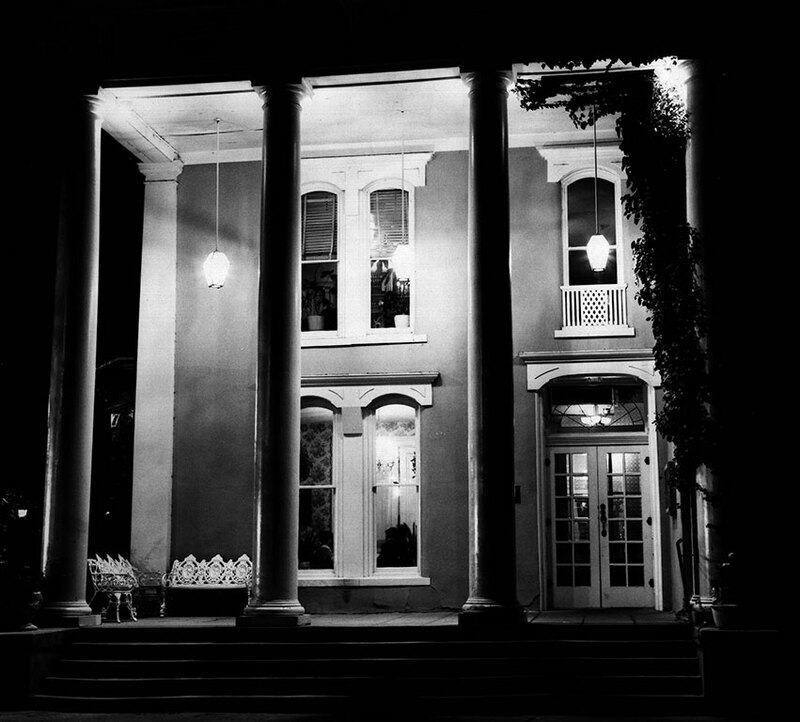 After a long drive to and from the Very Large Array, I enjoyed dinner at the Luna Mansion in Las Lunas, New Mexico. I ate there once before, in 1992. We made another hike at Villanueva State Park, followed by Madison Winery and The Sad Café. After dinner, I got about a million sticktights on my socks and shoelaces going into the back yard to photograph the sunset. 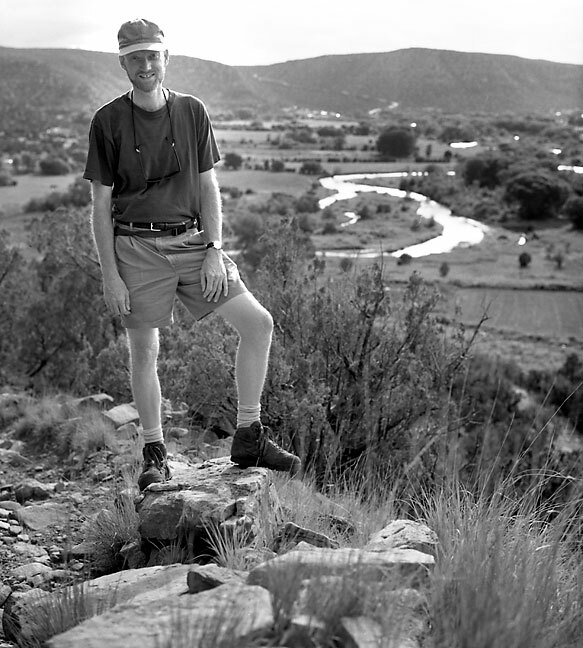 The author poses for a photo at the top of a short hike at Villanueva State Park, New Mexico. 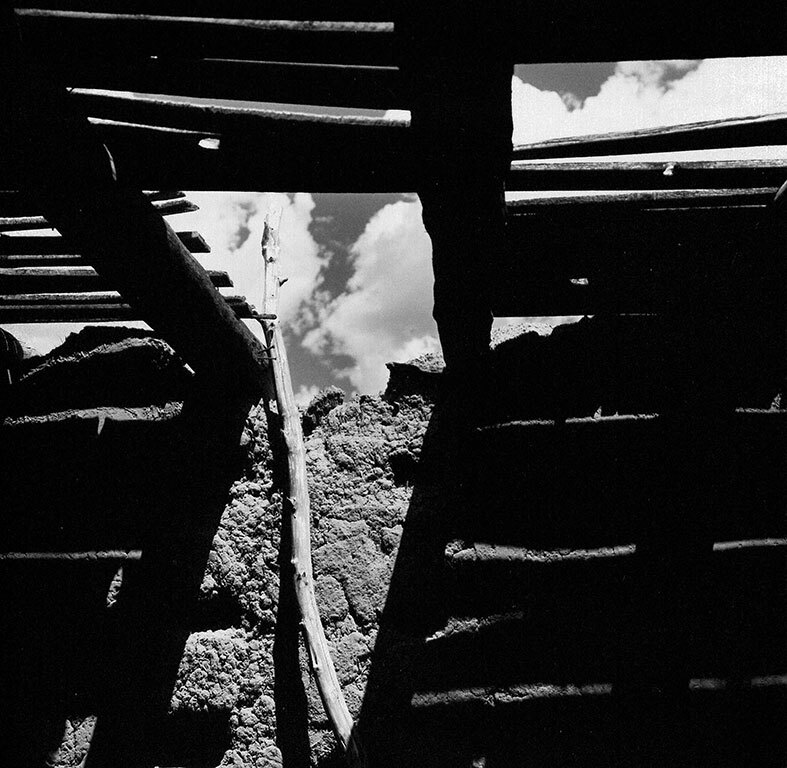 We spotted this collapsed adobe roof along New Mexico 3 south of Ribera. 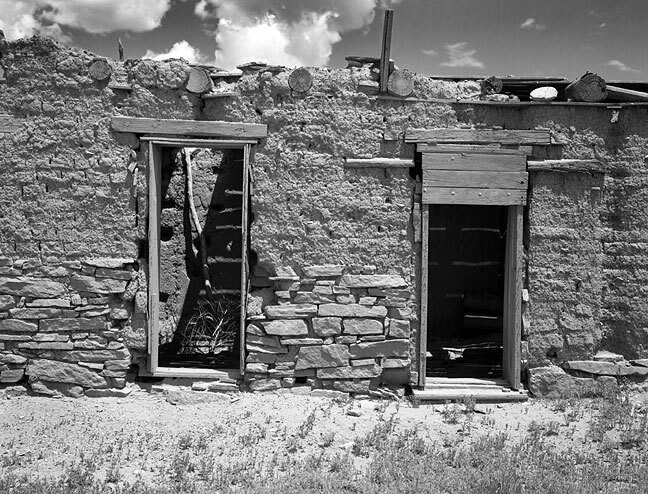 An abandoned house stands in midday light along New Mexico highway 3. 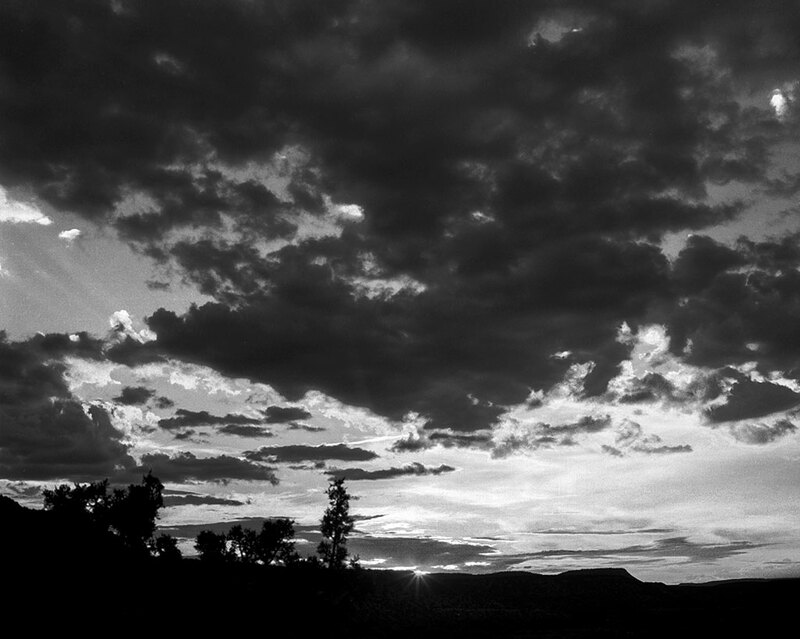 I originally shot this sunset Villanueva, New Mexico in color, but it rendered far better in black and white. 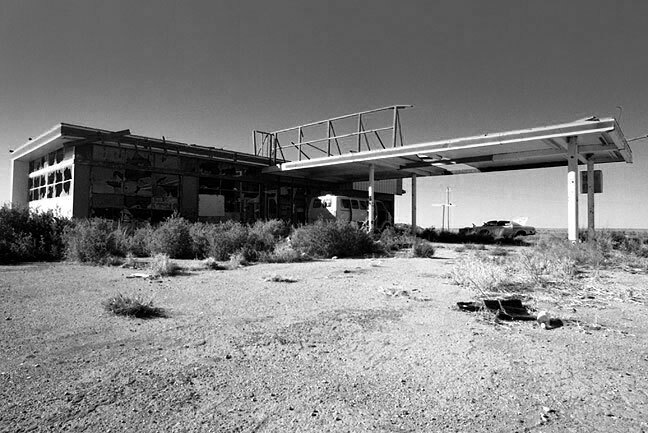 The “Plague Town” along Interstate 40 is a bleak reminder of the unforgiving nature of the desert. 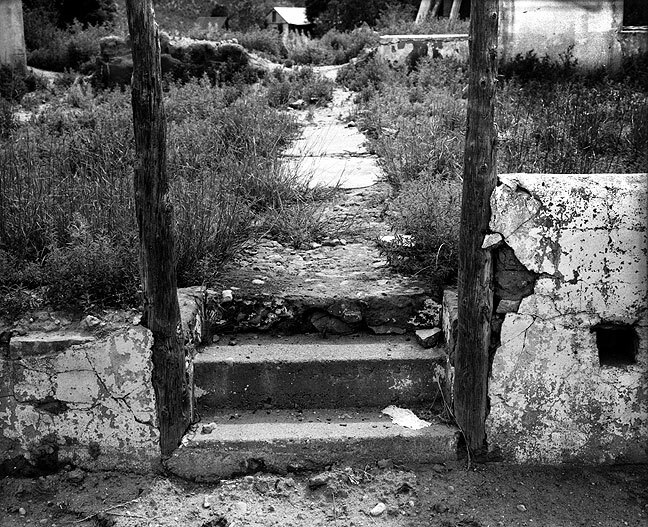 We stopped at an abandoned travel plaza east of Santa Rosa, New Mexico, which we nicknamed the “Plague Town,” in honor of its appearance. 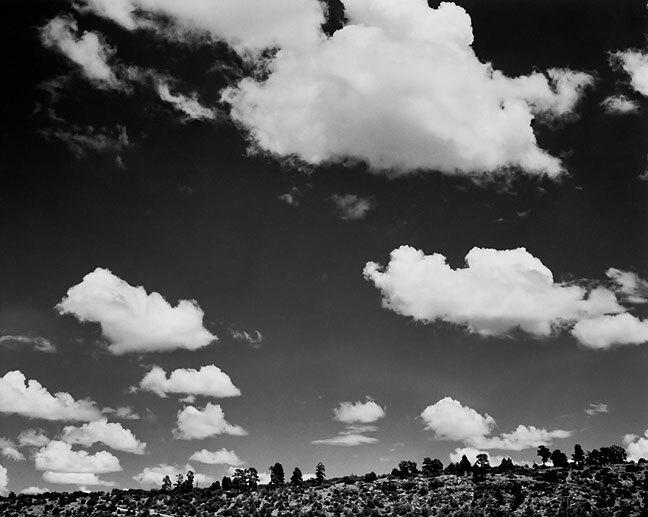 My time in New Mexico is, as always, some kind of journey home to a place I’ve never lived. 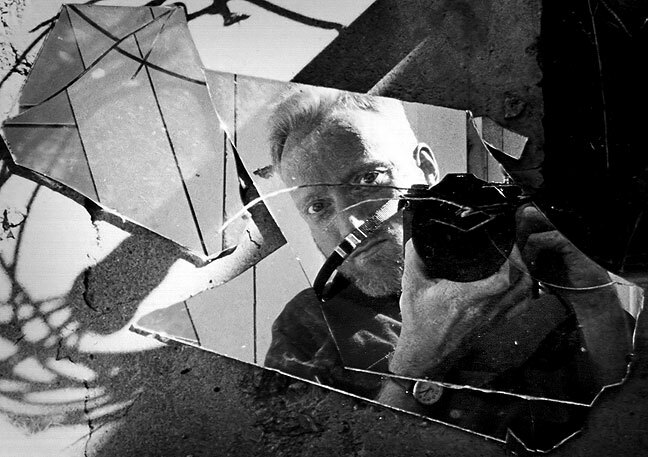 This is one of my all-time favorite self portraits, in a mirror on the ground at the so-called “Plague Town” along Interstate 40 in eastern New Mexico. 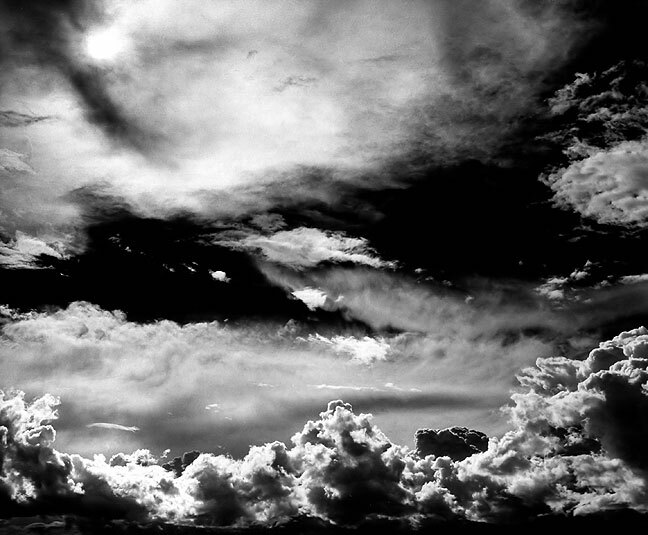 I love that these images are grayscale. Some of the most impressive photos you’ve made. I like the cotton-candy look of the water in “Stream, Pecos Wilderness.” Also the light and texture in “Mission in Early Morning Sun.” Some especially nice interior images, especially of the house you borrowed. 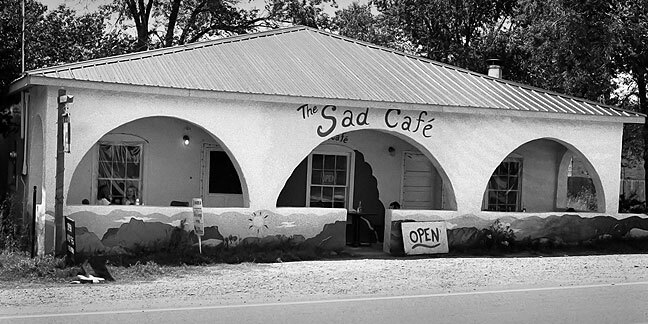 And isn’t there a movie called “The Ballad of the Sad Cafe?” I think I’ve heard that name. Anyway, superlative. The narrative flows nicely. 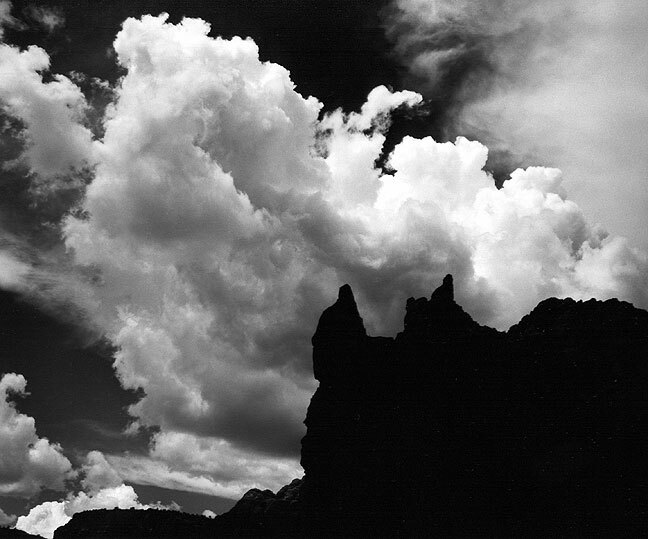 I recognize that feel of plus-x in your Stream, Pecos WIlderness image. I know it’s nostalgic but it just feels better -like how vinyl actually does sound warmer than a CD.